David Mead was born in London in 1906. 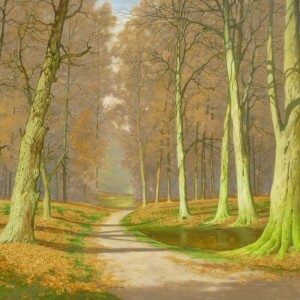 A self-taught painter, he started painting landscapes at the age of 9, greatly influenced by F W Hayes. Married with four children, he served in the RAF and then resigned from a later post in local government at St Marylebone, London, to become a professional artist. His works show influence of the works of Constable, Corot and Claude Cardon, the latter living in the same town of Whitstable, gave great assistance. One of his pictures was on loan to the National Gallery between 1942- 1944, and columns appeared in the press concerning his work, including the Daily Telegraph, Evening Standard, Evening News, as well as local and country papers throughout Kent, Sussex and West London. He was not an artist who sought publicity and never had enough pictures available for a one-man exhibition, generally only selling through dealers, one being in Vancouver, rather than at competitive exhibitions.